The countdown to Easter has begun! One of Flavours Catering + Events favourite things about Easter is Hot Cross Buns! Smelling those delicious Hot Cross Buns cooking in the kitchen is enough to get anyone in the Easter Catering mood in Sydney. Not sure where to get your Hot Cross Bun Catering Sydney from? You cannot go past our Famous Easter Catering Menu. Our Easter Catering Menu Sydney consists of Traditional Hot Cross Buns along with Choc Chip Hot Cross Buns and of course our Easter Catering special.... Easter Cupcakes with a novelty Easter topper. Flavours Catering + Events glaze our house made Hot Cross buns for our Easter Catering Menu the morning they are delivered. your team could not ask for a better treat than fresh hot cross buns, delivered to your office. Hot Cross Buns with melted butter? YES PLEASE! These hot cross buns never last long! 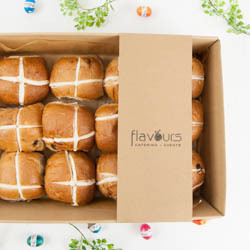 With Easter Catering Sydney You don't want to be slaving away baking your own hot cross buns for the office, have Flavours deliver your Easter Catering on the day or the afternoon before and leave them wrapped in the platter they were delivered on outside of the fridge. They will sit nicely overnight still fresh for the next morning. Looking to have your Hot Cross Buns or Easter Catering Sydney delivered? Look no further, call Flavours Catering + Events today on 1300 368 605. Remember hot cross buns are best served at easter time, fresh and smothered in butter! Not a fan of traditional hot cross buns? Try our choc chip hot cross buns! We also have Gluten Free, Dairy Free and Vegan options for your guests with dietary requirements. Flavours Catering + Events delivery all over Sydney. Please phone us on 1300 368 605 for more info or Click Here to order online.